Target 4.3 introduces technical, vocational and tertiary education into the global development agenda. They were considered part of Education for All, but only as support for alternate goals. The global indicator for the target — the percentage of youth and adults participating in formal or non-formal education or training in the previous 12 months — also embraces adult education. Hence, the GEM Report covers technical-vocational, tertiary and adult education under target 4.3 from the angle of the three concepts in its formulation: access, affordability and quality. Technical and vocational education and training (TVET) is provided at institutions, the workplace or a combination of the two. Given the variety of policy frameworks, institutional arrangements and organizational approaches, national statistical systems may only capture a partial picture, making TVET provision difficult to compare across countries. Current monitoring mechanisms emphasize enrolment in institutions, especially those supervised by education ministries. This considerably narrows the scope of monitoring the target. To include workplace-based education and training requires data from labour force, enterprise or household surveys, which need to coordinate their definitions and questionnaires more closely. Analysis for the GEM Report from 12 countries showed about 20% of youth had participated in workplace-based programmes. Questions of affordability should focus on the extent to which government policy helps address inequality in TVET access. The extreme diversity of providers, cost structures, public policies and national contexts makes it unlikely that a single indicator can describe affordability. A possible approach might be to look at the amount of institution income covered by students, compared with the amount of government financial support students receive. One approach to assessing TVET quality is to focus on whether reliable standards are codified in a national qualification framework. At least 140 countries have such frameworks. They vary in effectiveness but can help learners, providers and employers focus on outcomes rather than how qualifications are acquired. Tertiary education ranges from short courses to bachelor, master and doctoral programmes. Institutions vary widely in terms of size, cost, courses, procedures and quality. The question of equity needs to take into account hurdles at various stages from access to graduation. Global enrolment in tertiary education doubled from 100 million in 2000 to 207 million in 2014, but disparity across and within countries is huge. 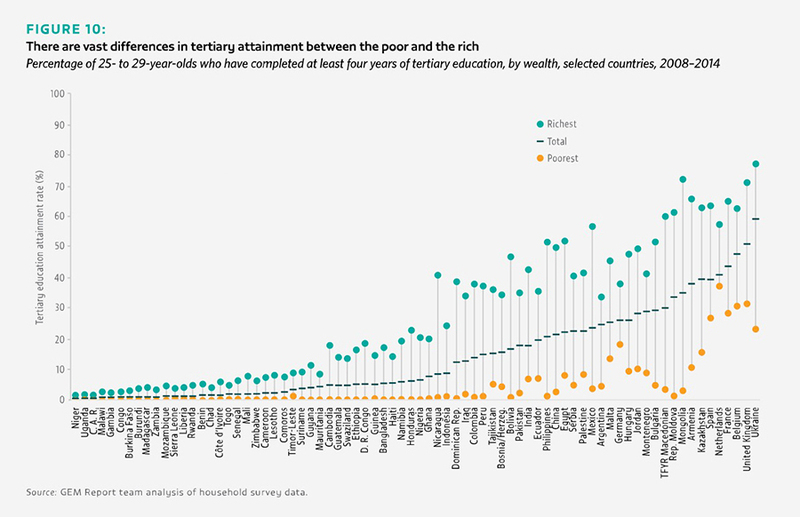 In the Philippines in 2013, 52% of the richest 25- to 29-yearolds, but only 1% of the poorest, completed at least four years of tertiary education. Affordability in tertiary education depends on the relationship between costs and income. Total costs can be compared with average household income levels from household surveys. While this is a useful guide, it does not show how many young people cannot afford higher education. A possible measure is to compare the financial burden for households with government financial assistance to households. Success in targeting those most in need should also be monitored. Differences in national policy structures and resources, and in university missions, pose considerable barriers to a meaningful global measure of quality in tertiary education. University rankings attract attention because they are simple to understand, but they are based on research rather than teaching quality or student learning. Adult learning, education and training opportunities form a strategy for achieving target 4.3, according to the Education 2030 Framework for Action. Adult education may be formal (institutionalized), non-formal or informal. The diversity of provision makes monitoring participation particularly difficult. While some information exists on adult learners in formal education, this is a very small part of the picture. In the 28 European Union countries, about 6% of adults participated in formal education and 37% in non-formal in 2011, according to a survey that could provide lessons to develop instruments to measure adult education participation globally. Assessment of affordability is constrained not only by the greater role of private financing but also by the lack of information even on public financing. Less than one in six countries spent more than 0.3% of GDP on adult education. Overall, more information on public expenditure is needed to understand how it is targeted at the groups most in need. Monitoring adult education, including its quality dimensions, is challenging. The third Global Report on Adult Learning and Education concluded that data problems exist in all world regions, undermining knowledge of adult education’s impact. It calls on countries to design systems that address obstacles impeding data gathering for monitoring and evaluation.